What do you do with the fastest road legal Chevrolet Camaro to ever leave the factory? Obviously, the correct answer is “make it even faster.” Which is exactly what the GM specialists over at Katech did for one local Michigan man. Known largely for their work building engines for Corvette Racing, Katech knows a thing or two about squeezing even more performance from GM’s stellar small-blocks. Already, the 2018 Camaro ZL1 1LE makes 650 horsepower and 650 lb-ft of torque from its stock supercharged 6.2-liter LT4 V8 which it shares with the”regular” ZL1, the 2018 Corvette Z06 and the 2018 Cadillac CTS-V. Katech went to work adding their Level 4 upgrade package, which includes CNC porting the stock cylinder heads, also porting the supercharger and snout, upgrading the camshaft with a new K-Force 2 replacement, a new 103mm throttle body, and including a Roto-Fab air intake system. Most importantly, the supercharger drive pulley was replaced with an ATI damper, and the crank pulley was beefed up as well. 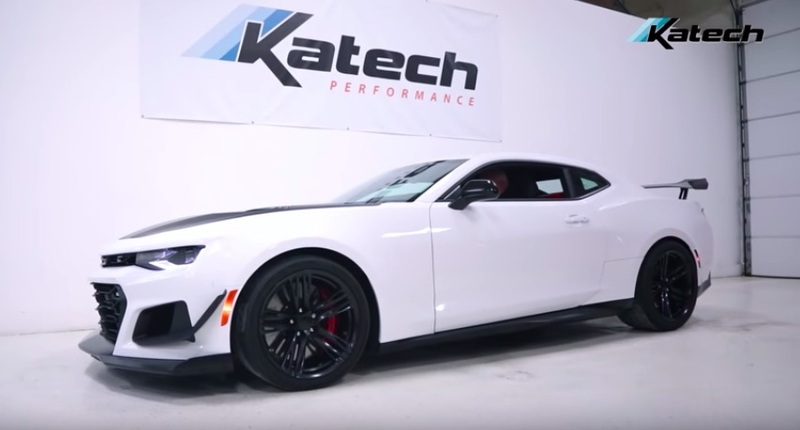 According to the video published late last week, the now breathed on Katech ZL1 1LE was making 701 hp and 657 lb-ft of twist at the rear wheels when it left the shop. The company didn’t release figures measured at the crank, but if we assume a 15% driveline loss, this new Katech ZL1 1LE is making somewhere in the ballpark of 800 hp and 750 lb-ft of torque. The new Katech ZL1 1LE retains the car’s stock aggressive aero package, Multimatic DSSV dampers, and factory Goodyear Eagle F1 Supercar rubber–305 at the front and 325 at the back. The stock Camaro ZL1 1LE chassis can pull 1.10 g worth of grip and weighs 60 pounds less than the regular ZL1 coupe. It might not be as insane as the Hennessy kits, which can boost output past the 1,000 hp mark. Or even the Whipple equipped Katech Camaro ZL1 1LE the company built for drag racer Tony Bartone, but it’s certainly enough for a retired man looking to make his fast car even faster. You should be ashamed of posting that BS here. Take your garbage elsewhere!